We're moving to Cape Cod in July and I can't wait! 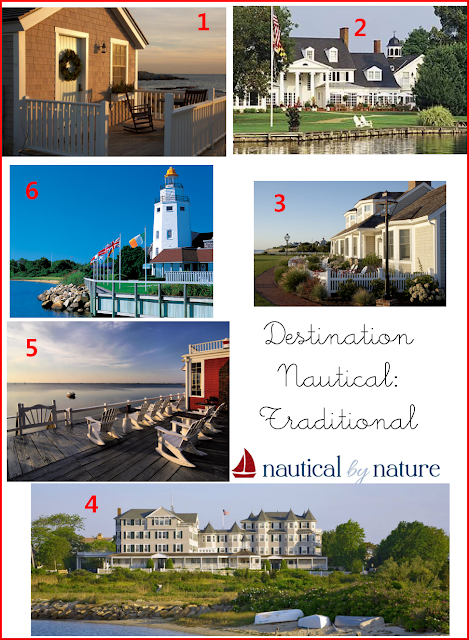 We lived in Cape May, NJ and there are some beautiful, traditional nautical views from there. Specifically the fishing fleet as seen from the Coast Guard base, and the light house on Cape May Point. How exciting! You will to stock up on nautical decor for your new house! White Elephant in Nantucket, MA! That has to be on your list! I will add it to my list. I love the name! My dream is to get married at the Chatham Bars Inn! I just LOVE the Cape! It's one of the things that I miss most about living up north. Can't wait to get back there and visit, hopefully this summer! Definitely can't forget the White Elephant on Nantucket, like The Swanbergs noted! Wonderful list, hope to have all of the locations checked off the to-do list one day! Bookmarked the White Elephant! Two votes it must be great! I really loved The Cloister hotel in Sea Island, Georgia. A very preppy and nautical spot! I spotted everyone sporting some Lilly down there! I am doing a separate list for spots in the south. I will be sure to include the Cloister! The Grand Hotel on Mackinac Island! Not only is view of the Great Lakes from the Grand Hotel absolutely stunning but Mackinac Island is simply adorable. No cars are allowed on the island so it is only accessible via horse and bikes. A place that everyone must visit at some point in their life! Wow, that looks beautiful! And I love the idea of no cars allowed. Anything on the West Coast!